I really enjoy the detective genre of manga, not just because I love a good mystery but because of all of the different ways that it can be approached. There are the complex cases of The Kindaichi Case Files, the cartoony but dangerous exploits of Detective Conan, and more light-hearted fare like 888. 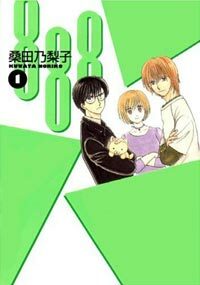 888 tells the story of a small detective agency, consisting of laid back manager Hisago, administrator Tsukumo, investigator Shimeki, and Kobayashi-Kun, Shimeki’s beloved dog. Occasionally, they get a job, but it’s usually small potatoes, like finding a lost pet. No one gets murdered or even robbed in this book, yet somehow the trio manages to keep busy. The stories are funny, staying just grounded enough in reality to be relatable to real life, while still being very strange. The art for this book is slightly boring. Looking at it, it’s hard to tell if it’s shonen or shoujo, whether it’s a recent artist or something from twenty years ago. There are just not any distinguishing characteristics to make the art memorable. It’s easy enough to read and understand, but it’s not much else. This book was released by DrMaster, the manga company formerly known as ComicsOne. It’s still the same quality, with cheap paper and periods of light printing that make the manga look washed out. In the past, I’ve found their translations to be a little too literal, but at least everything read well in 888. The personality of every character shines through, but the dialogue never seems Americanized. Kill Me Kiss Me has been a smorgasbord of gender bending, fist throwing and cursing craziness since the very beginning. In the last book of the series, Que Min, a crazy violent fighting girl has fallen into dating Ghoon Hahm, leader of an even more violent gang, and the only guy who can beat her up, all in order to protect Jung Woo, a boy everyone mistakes for a girl who happens to have a few moves under his sleeve as well. 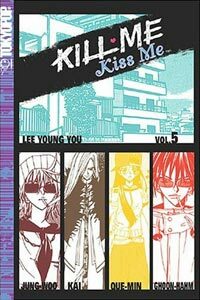 Throughout its five volumes, Kill Me Kiss Me gets very close to creating really lovable and memorable characters, but there are two things going against it. The first is that the characters seem to come and go all over the place. Besides Jung Woo, no character appears in all five volumes, and once they've had some time in the spotlight, they seem to fall off of the face of the earth. Second, there are a lot of loose strings lying around, mainly because of the scramble of characters. After all the fighting and bickering, and sexual frustration, there's not enough closure. Does it drive you crazy when the main characters in a manga can’t express their feelings for each other? Then Love Roma is for you. 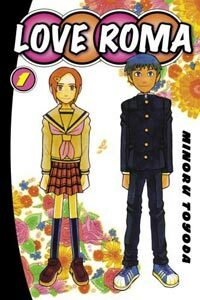 In the very first panel, high school student Hoshino tells a girl named Negishi that he likes her and he asks if she’ll go on a date with him. From there on, the two get to know each other (Negishi had never even met Hoshino before he asked her out) and they quickly become a couple. Del Rey has picked a very sweet and very funny manga to translate. Hoshino’s bluntness causes some embarrassment for Negishi, as he discusses their relationship with her in school while the rest of the class listens. It also leads to the sweet moments when the two talk candidly about their feelings for each other. Although Love Roma is mostly a comedy, the romance is very well done. The artwork puts an emphasis on the comical aspects of the manga. The character designs are blocky, and everything has a geometric look to it. Sound effects are left in Japanese, with English translations added next to them. Whenever a Japanese cultural reference came up, I had to flip to the back of the book to read the notes on it. There aren’t many occurrences of this, but I’m glad things like the amida game were explained. Record of Lodoss War is one of those classic anime/manga series that every fan is supposed to see in order to keep their union cards, but somehow, I've never seen/read it until now. The plot is very simple and stereotypical fantasy: Parn, a fighter and the son of a famous knight, joins with the elf Deedlit; the dwarf Ghim; his best friend and cleric, Etoh; Slayn the sorcerer; and Woodchuck the thief to battle The Grey Witch, Karla and restore balance to Lodoss Island. 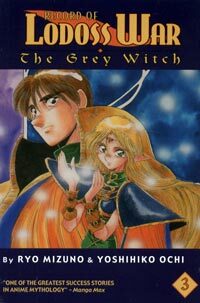 In this last volume of the original trilogy that begins the Record of Lodoss War saga, the heroes have reached the Kingdom of Valis, and they have saved the princess in a battle with The Grey Witch herself. Now they must discover Karla's origins and a way to stop her nefarious plans. Only the Great Sage Wart can give them these answers, so off the party goes on this final side-quest before the battle. I'll apologize for the corny epic language above; this book is so D&D, it's not funny. More than once, I had an ongoing commentary in my head on how the characters were rolling their dice.